YA-10A: A-10 test and development aircraft. YA-10B: Only produced two-seat A-10. OA-10A: Administrative' aircraft type designation. The sole YA-10B (73-1664) is preserved at Edwards AFB, California. TAI USAF ANG AFRC Tot. Following the end of the cold war several squadrons / wings were disbanded either transferring its aircraft to other squadrons or flying them to Davis-Monthan to enter storage. 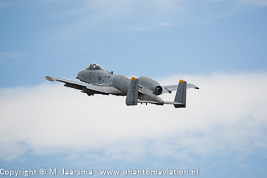 Depending on sponsoring by Air Combat Command the West Coast A-10 Demonstration Team assigned to the 355th FW can perform at air shows. 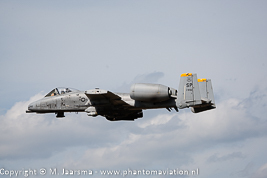 In 2011 the team visited RIAT held ar RAF Fairford, UK borrowing two A-10Cs from the 52nd FW based at Spangdahlem, Germany. On January 7, 2017 the A-10 demo team was certified by the 355th FW / CC for the 2017 air show season. Two A-10As assigned to 355th FS / 354th FW "AK" returning totheir homebase Eielson AFB, AK in 2004. 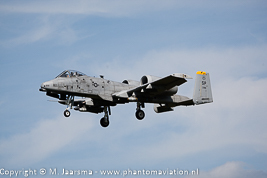 One of two A-10Cs assigned to 354th FS / 355th FW "DM" photographed at Schiphol, Netherlands in 2015. 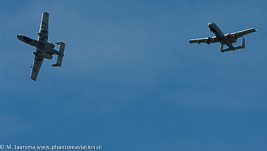 One of four 81st FS / 52nd FW "SP" A-10Cs performing overshoots during the Gilze-Rijen spottersday in 2012. 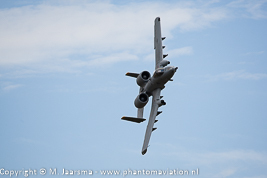 One of four 81st FS / 52nd FW "SP" A-10Cs performing overshoots during the Gilze-Rijen spottersday in 2012. 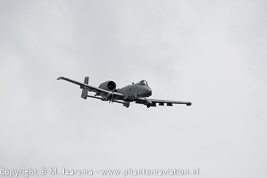 One of four 81st FS / 52nd FW "SP" A-10Cs performing overshoots during the Gilze-Rijen spottersday in 2012. 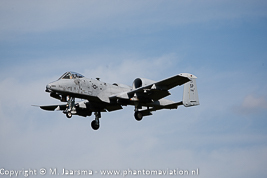 A-10 demonstration by the 355th FW West Coast demo team during RIAT 2011 at RAF Fairford, United Kingdom.